Saving you money means big bucks for Groupon. The Chicago-based deal Web site's revenue shot from $33 million in 2009 to $760 million last year, the Chicago Tribune reports. An internal memo shows how the company has grown in the past year: it hired more than 3,000 employees and offered customers in 500 new cities coupons for food, drinks, yoga, LASIK and hotel stays, among other things. The memo, sent to staffers by chief executive and site founder Andrew Mason, states that more than a third of Groupon's sales in 2010 came from outside the U.S., according to the Tribune. But Groupon isn't stopping there. Mason reportedly wrote that he wants the company to bring in "billions" in 2011 and increase the site's e-mail subscriber base from 51 million to 150 million. Groupon ruffled feathers recently with a trio of now-infamous Super Bowl ads, and again with a confusing $20 coupon for $40 worth of flowers and gifts from FTD florists. Buyers laid the smack down on the site, complaining that the deal was a scam. 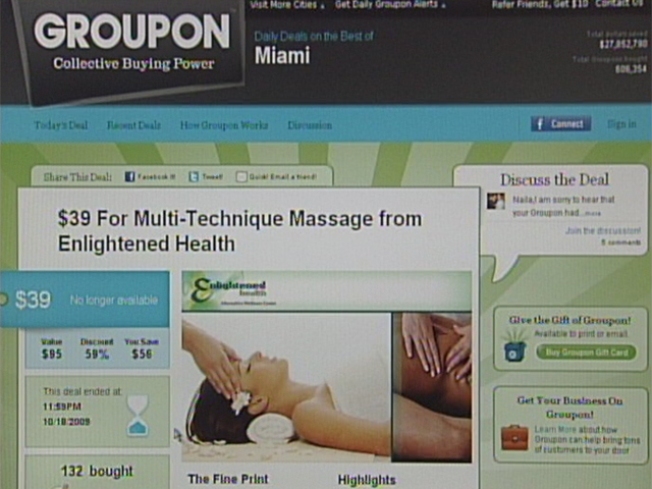 Item prices were reportedly higher on a special Web page that FTD set up for Groupon sales than on the regular site. The company reportedly raised $950 million in funding earlier this year after rejecting a $6 billion acquisition offer from Google.